Before I start telling you about this pregnancy, let me remind you about how it started with Elijah. In February 2008, I donated blood at the local blood connection. I randomly asked the phlebotomist, “What happens if you give blood and you are pregnant?” The response was, “You may miscarry?”. Well, you can guess that I took a pregnancy test the next morning. I took a pregnancy test at 6:30 am, 7:30 am, 8:30 am, and 9:30 am. I told my husband that night by putting a pregnancy test in the bottom of a chocolate tin. I told him I had something sweet for him. It was Déjà vu in January 2010, I donated blood again and thought about my experience from 2008. Just for kicks I took a pregnancy test the next morning. Well, I actually took four again, just to confirm. This time Elijah, my first son, carried the tin with the test in the bottom to tell Russ about our next addition to the family. I couldn’t believe we were going to be parents again. I would have never imagined myself as a mother to sons. I am somewhat of a girly girl. I like things clean, neat, and in order. Boys are rough, love to be dirty, but oh do they love their mommy. Our first son stole my heart the day he was born and I knew our 2nd son would too. When thinking about this birth, Russ and I knew we wanted the same preparation and birth team. Dr. Wood would do the hypnobirthing sessions with me. Julie would be our doula. Dr. Stafford would do the prenatal and be the baby doctor as well. Greer Memorial would be our place to birth. Our team last time was amazing and we wouldn’t want it any other way this time. The due date was set for September 11, 2010 and when that date rolled around and no baby, I wasn’t surprised. Elijah was 13 days post due. My babies like to cook as long as possible. On the night of September 17, 2010, I was admitted to the hospital to start a non medicated Foley balloon to encourage labor and was scheduled to begin Pitocin the next am if the balloon didn’t work. My husband and I prayed and prayed that things would go like last time. With Elijah, I went into labor 30 minutes before the Pitocin was to start. I started having contractions almost as soon as the balloon was placed. Unfortunately, it was back labor. This went on till morning when I again was able to opt out of the Pitocin. My contractions were consistent and completely bearable. Once he was turned the back labor stopped and made labor even more comfortable. Around 9:45 am, Julie told Russ to go get some breakfast. We didn’t think I was going to have a baby that morning. Russ came back to a whirl wind. Before he returned, my water broke (10:10 am) as I was leaning against the end of the bed. 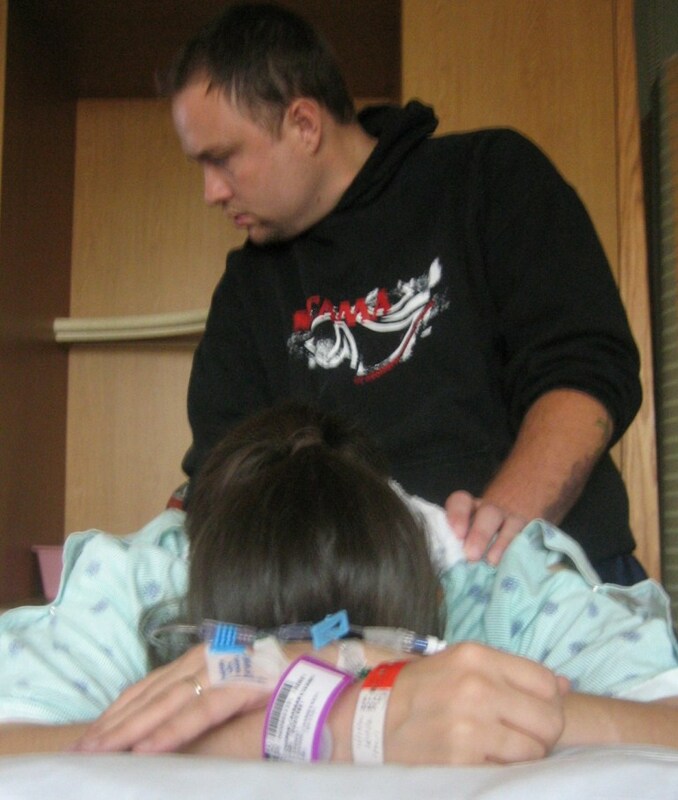 The contractions were all of a sudden hard and persistent almost seeming like there was no break between them. The edge of the bed was no longer a comfortable position for me so I moved to the bed on hands and knees facing the wall. I used the back of the bed as a brace. The nurses were informed that I was pushing. No urgency was seen in their eyes. They attempted to call the doctor with no luck. Julie and Russ thought that they may be delivering the baby. Just in time, the nurses came in and delivered Cadence. Unfortunately, Dr. Stafford didn’t make it. From the time my water broke to delivery was 35 minutes. It surprised us all. My labors were similar in how they started. Similar in the way I labored. I never stayed in the bed. I moved around the room, laboring on the birthing ball, in the tub, hands and knees, and leaning on my husband for support. My support team was amazing again. My husband stood by me the entire time. He sensed my needs through every pressure wave. He was incredible. Our doula, was there to lead us through everything. We felt like we needed her more this time then the last. The last 35 minutes were intense and somewhat scary. She helped us stay calm and joyfully welcome Cadence into this world. Even though my doctor, Dr. Stafford, didn’t make it in time, his support throughout my prenatal care and laboring made us feel confident. The nurses, Susan and Mona (she delivered), were great. They followed my birth plan exactly. They were open to our needs and that is what patient care should really be. We welcomed Cadence Isaiah Chapman to the world at 10:45 am weighing 9 pounds 15 ounces and 22 inches long. Cadence reminded me so much of Elijah besides of course the 2 extra pounds and inches. Having a child is such an amazing gift and blessing. 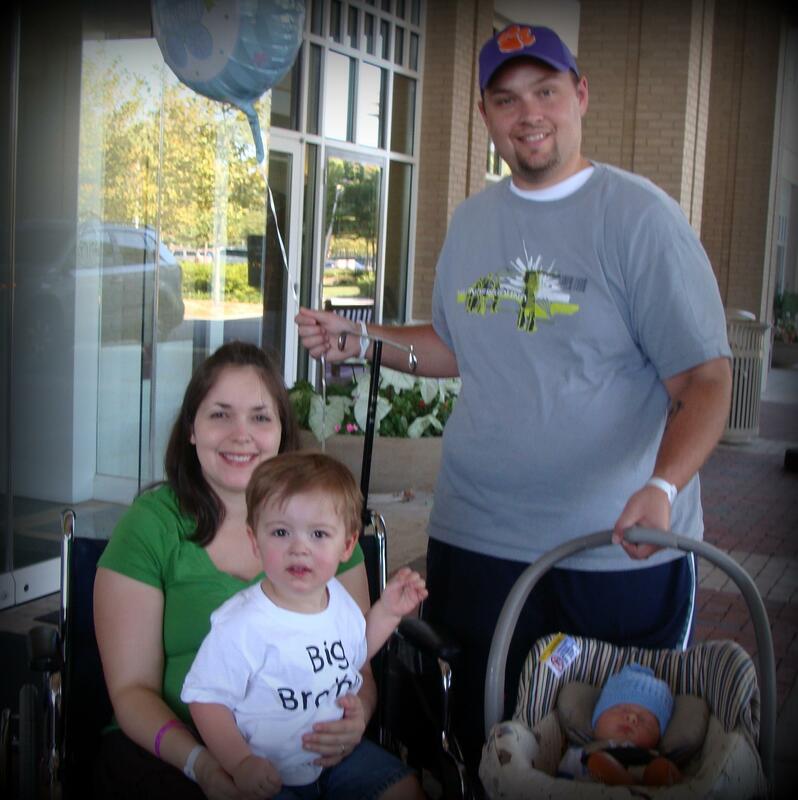 We are forever in debt to the people who helped us bring these two miraculous boys into this world. Most importantly, we thank God for letting us borrow these precious boys of His. Julie’s Note: Baby Cadence was posterior when labor kicked in. Elizabeth used the tub to work with back labor. I asked her to do the “rotisserie” in the tub which took about an hour. Then, after sifting her for an hour while she sat on the birth ball, Cadence rotated nicely at 9am. A very obedient soul!